With the amount of content shared every day (so far 355+ million tweets posted and 36+ million photos uploaded on Instagram in a day – Source), it becomes essential to carefully think about what to do and what not do when it comes to sharing on social media. Let’s start with the things you should most definitely do if you want to boost your social media performance. Every company or an individual should define their own voice and an approach on social media. Since the primary goal of social networks is to connect and communicate, the brands need to establish a presence that is relatable. Determining how your write your status updates enables you to create a recognizable voice and increase trust. The voice is defined by the language you use, jargon, formal or informal phrases, humor, etc. Each company has a distinctive voice that resonates well with the target group. Some will use informal language and jokes. Some will choose a more serious tone and status updates that are void of any humor, but if this is something that will enable their target group to connect with them and relate to such status updates than this would be a go-to strategy. Consistency in the way you address your target group is also important. The best way to effectively target your audience, as well as to create and share content that speaks to them is to know your audience. This way you get to design a personalized approach and a strategy that has the best chance of succeeding. When sharing on social media, it’s helpful to think about your audience, their habits, expectations, and needs. Knowing this enables you to predict what they would need and to tailor your content marketing strategy in a way that gets better results. For a brand, connecting with followers is important because it builds brand trust and reputation. Just posting status updates with low engagement level doesn’t really help with promoting your business. Instead, when sharing, try to connect with your followers by creating relatable content. Also, use every chance you get to interact with your followers. You can share their feedback, respond to comments, share their success stories, etc. Although online promotion is the number one reason that comes to your mind when thinking about using social media for business, there is a growing trend of using social networks for customer service. The concept is based on the fact that a lot of online users turn to social media to look for advice, to make an inquiry or to communicate with a brand in general. Achieving this attention is so much easier if the brand has a responsive customer service that can provide the answer through this media. The keyword is responsive. One of the main reasons why modern customers choose social networks for communication is because it enables quick and easy communication. When using social networks for this purpose, you can use a specific hashtag or even a separate account altogether. Do you want to learn more about using social networks for customer service? Check out this article with examples you can learn from: 14 Amazing Social Media Customer Service Examples (And What You Can Learn From Them). There is a great diversity of content being published constantly online, and as a part of your social media activity, sharing that content will probably find its place on your social media profile. However, always have in mind that authenticity is what helps you define your brand, establish your reputation and eventually build a unique name on social media. Therefore, it’s essential to be the creator and publish content that is one of a kind. It’s generally known that status updates with photos increase engagement. Therefore, one of the things to do on social media is to share visual content. The form of the content can differ from post to post. You can use your content, you can share other people’s work, or you can collaborate with designers and content creators who can create visual content for your brand. The important thing is to incorporate the usage of the visual elements. It’s also important analyze the performance of those so that you can really make the most out of such content and the engagement it brings. Here’s a helpful guide with resources, ideas, and tools to help you explore the ways you can use visual content when sharing on social media: How to Boost Engagement on Social Media with Visual Content. Despite the fact that social networks have a lot in common, and that you will be sharing pretty much the same content across all of them, it’s still worth it because each social network has something distinctive about how it presents content and how the communication is done. For example, if you’ve just published a blog post and you want to share it on social media, it’s advisable to share the status update that is tailored for each network where you’ll be sharing this article. On Twitter, your status will be limited to a 140-character length, so you’ll choose the most important (and engaging) quote or a statement. When it comes to Facebook, you’ll be able to be more elaborate, and you’ll also add an image to this post to increase its engagement. On Instagram, the focus of your status update will be the image which might be the one used in the article or an entirely new one designed especially for this purpose. On Pinterest, the image is again in focus, but the image dimensions should be different to accommodate Pinterest boards. You get the idea. When you share content on social media, try to tailor that piece of content to the network and the users who are going to interact with it. While following best practice above is a great way to boost your performance, it’s worth checking out the practices that might be slowing you down and tainting the brand name you work so hard to establish. Social networks are quite addictive, and before you know it, you’ll end up spending hours browsing through tweets, exploring hashtags, thinking what to post next, replying to comments, etc. To avoid spending too much time and wasting most of it, try to be focused during your social media activity. Assign a certain amount of time to this task, and plan activities you want and need to do. Use automation tools to help you save even more time and optimize your work. When it comes to social media activity, spending too much time does not instantly mean being productive, so make sure you don’t overdo it. Automation can help with optimizing your workflow, so here are a couple of ideas to automate your social media activity effectively: 7 worthwhile ways to automate social media. Having diverse knowledge is quite handy during a game show, but this isn’t something you should share on social media (unless you have a profile that is about sharing trivia). You want to create your own distinctive voice and specialize in connecting with your followers through the content you share. For example, if your business is a cooking blog, you don’t want to share an article about SEO. Even if you do know a thing or two about this topic, it isn’t something you specialize in, or your audience is interested in learning about. Staying focused when creating social media presence is very important. Some brands get so overwhelmed with this task, that they fail at recognizing the crucial aspect of social networks. It’s all about connections and interaction. Sharing status updates is definitely one of the top tasks that helps you promote your brand. Still, you must not forget the power of interaction. This interaction can take many forms on social media. You can reply to comments, you can quote social media users, share their images, etc. On one side, posting consistently is important. And let’s face it, there is no chance you’ll be online all the time and able to post every few hours. A large percentage of online marketers rely on automation, which is an amazing way to optimize their work. However, try to use this method of social media activity in a controlled manner. The most obvious example of automation going too far is using tools to publish the content from your blog automatically. Over and over again. Even though some brands do it, you shouldn’t. Such activity completely removes any level of personalization and connection with your audience. In this case, automation will actually do you more harm than good. Eventually, you’ll start losing followers, and before you know it, your credibility will go down the drain as well. People share their lives on social media. It’s only natural to expect them to share both the good and the bad. As a business (and as a person behind your business) you can’t please them all. There are those who will love your products (services, etc. ), and yet there are those who won’t. There are those who might even undermine your activity or spread false reviews. To be honest, haters are everywhere. On the bright side, this shouldn’t stop you from being active on social media, standing up for the idea you believe in and communicating with followers. Instead, find the way to deal with criticism (and haters) in a professional way. This will add up to your credibility and respect on social media because most of this interaction will be publicly available to all social media users. Realistically, success doesn’t happen overnight. Well, except for an occasional cat video going viral. As a brand, you will have to work really hard to gain reputation on social media. This means that you will need a lot of patience when starting out. You will also need to focus on analyzing your approach and refining your strategy to increase performance. All of this takes time. This is why the online reputation is valuable. This is also the main reason why brands should be consistent and professional in their approach. Once gained reputation is something that needs to be nourished. Seeing the followers counter rising is amazing. There’s no doubt about it. Engaging those followers is an even more difficult task. Don’t expect the engagement to go up as the number of followers does. This isn’t something that is mutually conditioned. Instead, consider these two as separate tasks that require different strategies. You’ll use one approach to attract new followers. You’ll then need a method to engage them and encourage them to interact with your brand on social media. Being successful at both of these areas is equally important. 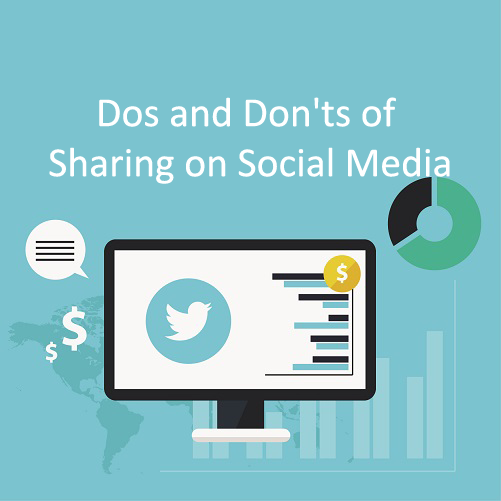 There is an engaging quote from a popular WordPress social plugin, which is “Sharing is caring.” This perfectly summarizes everything about dos and don’ts of sharing on social media. You should care about your followers. Think about them as real people behind those profile images. Share content that they can recognize and relate to. This kind of content speaks to them and is more likely to increase engagement. Combining the strategies above and creating such personalized and relatable presence will help you tremendously in your efforts to establish and leverage the power of social networks.